As a whole, the American Civil War was fought by two sides. At the beginning of the war the Union fought with the expressed desire to preserve the current American political system and a united nation. The Confederacy fought to be free from the bond that tied them to an economic and political system that no longer shared their views or interests. As the war waged on the idea of fighting to abolish slavery was added to the Union’s rallying cause. The Emancipation Proclamation was President Lincoln’s new measure in continuing the Civil War. The Proclamation, although originally only freeing slaves that had escaped from the South to the Union, did change the Union’s focus of the War from a mission of preservation to ultimately a mission of liberation. It is necessary to build a case study that analyzes the importance of the Emancipation Proclamation as well the new roles for residents and citizens of the North in the changing focus of war. It is under the scrutiny of this analysis that it will become clear that the shift from preservation to liberation was not an entirely popular change. The students will analyze the views surrounding the meaning/action of the Emancipation Proclamation as well as actions taken by Northerners to show their discontent with the conscription draft and the liberating of slaves. This is an important lesson aimed to illustrate that the decisions made by the governing force are not always unanimously supported by the whole group, and that shifts in policy regarding the war effort can have negative and positive effects on the citizenry. By the end of our case study, students will have analyzed and categorized primary sources revolving around the Emancipation Proclamation and the reaction to the conscription act by the people of the North and will construct an essay response to the case study question. MCPS Unit 8.4: "A Nation Divided & Rebuilt"
Image located at: "How to escape the draft"
Image located at: Thomas Nast "Emancipation"
6. Frederick Douglass "Men of Color, To Arms!" Review the key events of the civil war (MCPS pg. 87) from a previous class. Answer focus questions associated with key event chart. 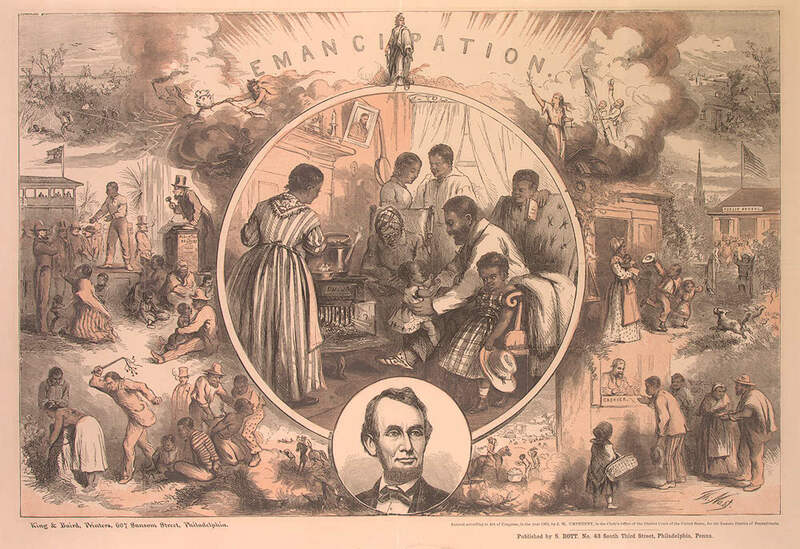 Close Reading Activity: Students will do a close reading activity on the Emancipation Proclamation and the Conscription act of 1863, they will use teacher directed reading strategies to analyze and answer reflection questions on the two documents. Warm Up: "How to escape the draft"
Present case study packet, the details of the assignment, and the guidelines for writing an essay response reporting their findings and claim on the case study question. Warm up: Thomas Nast "Emancipation"
Categorize evidence into possible topic/support paragraphs. Students will be given the opportunity to begin to write their opening thesis paragraphs and to work them over with the help of peer reviews. It is up to each individual teacher, on level students could analyze fewer sources, and there could also be a change in the assessment requirement. The assessment for this lesson will be their Essay. By this time of the year the students have gone through several primary source led case studies and written several essays in class. This is a continuation on this skill in preparation for writing a DBQ or DBI. This website includes several issues of Harper’s Weekly scanned in and arranged in chronological order. This is a great source for being able to view sources on our Promethean board as well as provide a visual for students to understand what information coming out at that time period would have looked like. This is a transcript of the full Congressional act that officially begins the draft. This will help the students understand what the law officially wanted people to do and what a draft means. This site provided many sources that were useful in building the case study. The David Blythe Painting of Lincoln is a great parallel to the image of Washington that we had used in a previous class. The correspondence to/from Frederick Douglass will also provide a great source for students to analyze the question of our study. This is a great source to help students see that there was support by Union soldiers to continue the fight even after that Emancipation Proclamation. This source also highlights that there is still an issue as to what to do with the slaves once they are set free.